sapporo « Japan, Hockey, Baseball, etc. A good article by Bill Meltzer, as always, in the NHL.com’s Across the Pond series, on the victorious Hungarian team at the World Championships Division I B in Sapporo last month, and their triumphant hero’s return to their homeland where they were greeted by 1000 fans! Wow, this just shows how Hungarians are really getting into hockey, I can’t imagine the same thing happening in Japan had Japan won the promotion up to the top division elsewhere and returned home. But the more interesting part of the article for me is the inset box. Over the course of the last decade, Alba Volan Szekesfehervar has become the most dominant club team in Hungary’s domestic league, OB1. This season, Alba Volan won its sixth consecutive Hungarian championship and eighth title in the last 10 years.More significantly, the 2007-08 season marked the first time Alba Volan competed in Austria’s Erste Bank Eishockey Liga. The Austrian circuit, which also includes Slovenian clubs Olimpia Ljubljana and Acroni Jesenice, is a significant step up in competition from OB1. As expected, the Hungarian team finished in last place in the Erste Bank Liga by a large margin. The club lost 35 of its 42 games. Alba Volan by far had the league’s weakest offensive attack and allowed the most goals in the league. Even the ninth-place Graz 99ers finished the campaign with 30 more goals scored, five fewer goals allowed, and 17 more wins (10 in regulation, five in overtime and two in shootouts). Meanwhile, during the OB1 regular season, Alba Volan iced a club of developmental players. The team finished sixth in the seven-club league, but the key players on Alba Volan’s Erste Bank Liga roster returned for the playoffs. The Hungarian finals saw Alba Volan defeat Romanian club HC Miercurea Ciuc in four straight games. The decisive 6-0 victory in Szekesfehervar was played in front of a capacity crowd of 3,500 fans. So, Alba Volan simultaneously contributed to making the Hungarian national side stronger with their participation in the much tougher Austrian EBHL, and came home and defeated a Romanian side that reached the Hungarian championship, but in turn the Romanian team’s participation in the Hungarian league is making their national side stronger as well. Japan is in on one end of a similar deal with the Asia League, as it has bring up the level of play of the Korean clubs and national team (the Chinese are more questionable). But Japan is not the beneficiary of anything similar on the receiving end as Japanese clubs are not participating in any leagues that are tougher than the Asian League. Is there a regional Siberian league? If so, what is it’s level of play? Maybe Japan can send in a club to that league if the federation’s really serious about moving up to the top division (doubtful, what with the lack of effort put into Sapporo). Even scheduling regular training matches against Khavarovsk and Vladivostok would help you’d think, but regular league matches would really help. westbaystars at Japanesebaseball.com does a logical analysis on the early season PL attendance figures. Compared to the same time period last year (up to games ending April 24), SoftBank takes the biggest hit, down 10.3% (27,036 per game). But Nippon Ham makes up for that, up 10.2% (23,362). Orix, having moved to Osaka Dome, is up a whopping 45.7% (16,429). While the article attributes moving to Osaka as the cause for the rise for Orix, I’ll contend that it was their great start that got people coming out. SoftBank, on the other hand, has had its worst start in years, thus the downturn. I think that when you compare results on the field with results in the seats, that there will be a close correlation – which the press doesn’t seem to get for some reason. Yeah, that seems like a way more plausible reason. I’ve only been to 2 games so far this season. A half empty Jingu for a midweek Swallows-BayStars tilt, and a Sunday afternoon Hawks-Fighters game in Sapporo that drew well (just north of 30,000). A well deserved win and promotion to the top division by Hungary! Ukraine decided that they coast through the first half of the game and still win, but no no no, Hungary fought hard for 60 minutes and it was a true team victory for the hard working team. Even had the Japanese goal counted and Hungary only got 1 point in that match, they would still have topped the table, so Hungary is the true champions despite some potentially costly miscues by the refs. Ukraine learned the hard way that Division I is no cake walk. Good luck in the top division next year Hungary! Videos from Day 4 of Division I in Sapporo. The official English site doesn’t have the game highlights but the Japanese one does (they’re slightly delayed because of the editing, but there’s minimal Japanese in the graphics, so I don’t see whey they don’t post them on the English site either..). Heartbreaking SO loss (2-3) for Japan in a very entertaining game that could have easily been 5-4 with many squandered chances going in both directions. Despite being outsized, outskilled, and outmuscled, the home team made it exciting with great speedy counterattacks and some almost-lucky bounces. Ukraine played their hardest so far in this tournament, so it’ll be interesting to see if they’ll finally come out full force against Hungary in the decisive game for the gold medal and promotion. The atmosphere in the arena for the UKR-JPN game gradually and steadily became more intense, and it was absolutely electric during the end of regulation, OT, and the SO which went into sudden death. That was good to see from the local supporters. Lithuania finally woke up against Estonia with a 4-1 win. Estonia’s put in a very tight spot having to win against Japan to avoid relegation. Hungary-Croatia was a bit of a snoozer with the Hungarians just waiting for the Croat legs to tire out, then pounding the goal for the sure victory. Croats need a club team or two competing in a higher calibre league to improve their national team, as domestic competition probably just breeds complacency. The winner of HUN-UKR match, the final one in this tournament, will be for the gold medal and promotion to the top division. 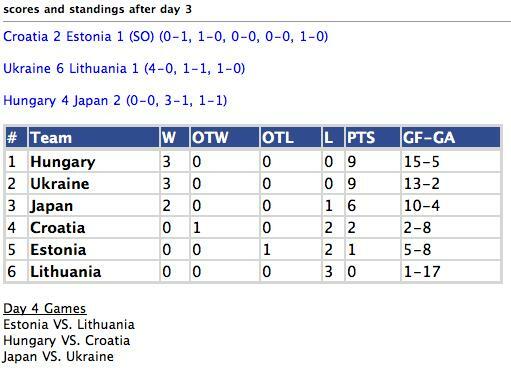 SAPPORO, Japan – Hungary and Ukraine will play for promotion on Saturday as both teams won their Friday games. Lithuania is out of the danger zone after having beaten Estonia, 4-1, in their Baltic clash. “Eesti” needs a miracle to avoid relegation. Brave Japan had a 2-1 lead in the second period and it looked like the team could hold on and compete with Hungary for the promotion, but it was Ukraine that came out on top. Sergei Varlamov scored the 2-2-goal with 51 seconds left of the second period and Dmytro Tsyrul scored the winning goal in the fifth round of the shootout to guarantee the Ukrainians the opportunity. Hungary and Ukraine will meet in the all-decisive final game on Saturday to determine which team will earn promotion to Switzerland 2009. Hungary leads Ukraine by one point prior to the game, so both teams need a win, either in regulation or in OT to gain the big prize. The one-point edge that Hungary has in the standings does not give them any real advantage under the three-point system as a tie is not possible. Kostiantyn Kasianchuk gave Ukraine the lead with a PP-goal 42 seconds into the second frame, but Takahito Suzuki made it even four minutes later. The crowd of 1,879 fans at the Sapporo arena went into high gear when Toru Kamino gave the home favourites the lead at 6:49. The Japanese almost held the score intact until the second intermission, but Varlamov’s late goal tied the score. Ukraine last played in the top division in 2007 in Moscow, while Hungary has not competed in any elite event since finishing 16th and last at the 1964 Olympics in Innsbruck. Hungary remained perfect with 12 points in four games after blanking Croatia, 3-0. After a balanced and scoreless first period with 9-9 shots, it was the Hungarians who took advantage at 35:01 with a goal scored by Imre Peterdi. Lithuania, which scored once in its previous three games, netted four against Estonia. It was Lithuania’s first win of the championship (1W-3L) while Estonia dropped to last place. Their only point so far came in the overtime loss against Croatia on Wednesday. Match day 4 provides 2 crucial games. Lithuania will have to start showing some signs of life against Estonia, otherwise they’re in real danger of dropping down to Division II next year. And Japan has to beat Ukraine by 2 or more goals to retain any hope of winning this tournament and advancing to the top division. I’m sure the motivated Hungarians will have no problems dispatching the Croatian team. Day 5 features the most likely “finals” of this tournament with Ukraine vs Hungary fighting to win it all and get promoted. Hungary’s Janos Vas (AHL Iowa Stars) joined the team before the Japan game on Wednesday, so he should be better adjusted to the time zone and Japan by the final day of the tournament (he only recorded 3 shots on net in the Japan game). Ukraine is still the heavy favourites though. It’s as if the Japanese organizers and the Japanese Ice Hockey Federation scheduled this game knowing that it will be the de facto “finals”. Very strange move if you’re the host country, you should be doing the most, including scheduling, to win the tournament. What is home ice advantage for after all? The potential relegation battle between Lithuania and Croatia could be interesting, and depending on how Japan did against Ukraine the night before, their match against Estonia will be a must win. A good take on the tournament atmosphere by a resident gaijin. Great game, great spirit from team Japan, coming back from 3-0. Poor refereeing, many penalties given to Hungary for nothing, clear japanese goal disallowed in the 59th minute (it was 3-2 for HUN in 59th min, beautiful japanese goal was scored, goal judge did not light the lamp, thinking he hit the bar). Japan is victim of stupid rules, no video goalie in Div I. WCs. Hungary played good until 3-0, then we got tired, trying to defend our lead. I’m not proud of this win, Japan should have deserved to tie the game here. Videos only tomorrow, I could not record the game. Ukraine took a 4-0 lead in the 1st period, then just cruised to their victory. Looking at this standings after day 2 makes it clear that this group has 3 strong and 3 weak teams. The winner of Hungary vs Japan will gain the right to face Ukraine in the battle to win this tournament and earn a promotion to the top division. Japan has two straight shutouts, but of the 8 goals scored 7 have been on the power play, so I’m concerned about Japan’s ability to score on even strength. On the other hand Hungary surrendered 3 goals to Estonia, so we’ll see how super Szuper is today (ooh, that was a bad pun). Croatia vs Estonia could be an interesting game, but I’m sure everyone involved expects the Ukraine – Lithuania tilt to be a bore, that’s too bad.